It will be an exchange program unlike any other. In winter 2019, three Indigenous students from Wilfrid Laurier University and three Indigenous students from Syracuse University in New York State will trade places physically but come together to create Indigenous curriculum content. Laurier developed the Indigenous Mobility and Curriculum Across Borders program in partnership with three American universities and two Indigenous partner organizations. Thanks to a grant from Santander Bank through the 100,000 Strong in the Americas Innovation Fund, the participating students will not only have a life-changing experience, they’ll have a chance to shape what future students learn about Indigenous peoples. “This program will be an exciting and unusual opportunity for Indigenous students to influence and have input into curriculum development,” says Jean Becker, senior advisor of Indigenous initiatives. Laurier associate professors Kevin Spooner (North American Studies and History) and Lucy Luccisano (Sociology) heard about the grant competition for innovative study abroad partnerships and collaboration from the U.S. Consulate in Toronto, which coordinates a working group of provincial higher education institutions, including Laurier. Spooner and Luccisano were immediately interested in doing something to fill the gaps left by typical exchange programs. To refine their idea, Spooner and Luccisano worked with Becker; Erin Hodson, Indigenous curriculum specialist; Lianne Leddy, assistant professor of Indigenous Studies; and Phyllis Power, manager of global engagement programming. The team developed the vision of a curriculum development project that would see students working with academic and community mentors. Syracuse University became the primary partner and the University of Buffalo (State University of New York), Cornell University, Woodland Cultural Centre in Brantford and Skä•noñh - Great Law of Peace Center in Liverpool, New York, also came on board to offer the students resources and mentors. Most of the costs to students will be covered through the one-time Santander grant, as well as other funding and in-kind support from the partners and several Laurier departments. “We have to reduce barriers for students who might not normally go on exchange simply because they can’t afford it,” says Spooner, adding the partners are working on ways to make the exchange sustainable for the future. The three Laurier students will be in Syracuse together. While the three Syracuse students may go to Laurier’s Brantford or Waterloo campus depending on their majors, all six participating students will maintain close contact as they work on their curriculum development projects, for which they will receive one course credit. At the end of the term, all students will assemble in Waterloo to present their work at a one-day symposium hosted by Laurier. The envisioned end result is six online curriculum modules that can be used as resources and incorporated into courses at any of the partner institutions. Students will also be able to access the content for research purposes. Hodson hopes the student-developed content will result in non-Indigenous students learning more about Indigenous issues and future Indigenous students seeing themselves better reflected and valued in class. “Nobody knows better what an Indigenous student needs at a postsecondary institution than another Indigenous student,” says Hodson. In some ways, the students will gain the best things about participating in an exchange – the chance to go somewhere new, meet new people, access different opportunities and generally expand their horizons. However, they’ll also have access to the best things about staying close to home, within a familiar cultural context. Hodson is looking forward to taking the Syracuse students to Six Nations of the Grand River near Brantford and introducing them to people there. She expects the students from Laurier will have similar opportunities in New York State. When the Syracuse students arrive, Hodson hopes their professors will reach out to her so she can suggest ways to better incorporate Indigenous voices, culture and knowledge into their classes. However, Hodson’s work goes well beyond one exchange program. She already works extensively with willing instructors across the university to improve the representation of Indigenous people in curricula. She sometimes makes knowledge-related suggestions, such as readings or guest speakers, and/or process-related suggestions, such as allowing students to incorporate lived experience into assignments. Hodson says there is room to make space for Indigenous people and ways of knowing without sacrificing academic rigour, regardless of field of study. 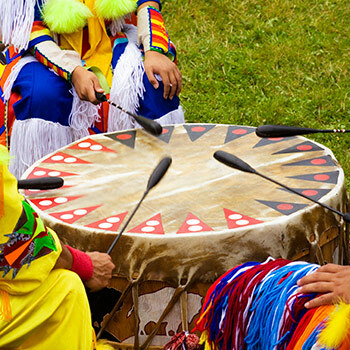 Laurier’s department of Indigenous Initiatives and Services offers a variety of supports on the Brantford and Waterloo campuses, including academic and personal counselling, visiting elders, soup and frybread lunches, Indigenous peer mentors, community gardens, and access to smudging and traditional medicines. Syracuse also has resources and services for Indigenous students, so both sets of students will be well supported. Indigenous students from any faculty interested in applying for the exchange program should contact Kevin Spooner or Lucy Luccisano for more information.